This brilliant 2003 release is an astounding look at World War One. In color, the images take on a reality which just cannot be gotten from viewing the footage in black and white. The scenes of the dead, the suffering of the refugees, all come to life in color. They are the same images which we see today on the news. The scenes of the Russian front in 1915 are so vivid that I was loking for Omar Sharif to pop up and rescue Lara! I was freezing watching the fighting in the cruel and cold Russian winter. These films affect the viewer as no earlier versions possibly can. Confronted, in color, the war seems so relative to today. And it is. The excellent narration by Kenneth Branagh, lends urgency to the images as you watch these newsreels. The history is all correct,there is no spin involved, as none is necessary. The message is clear. War is horrible. The recollections by the veterans themselves, are treasures. With unflinching honesty they speak of their fears when "going over the top." They are old enough to know that every breath is a blessing, and that wars cure nothing. They are the first to point out that the same conflicts exist today as existed prior to the First World War. With the looming 150th anniversary of the Civil War fast approaching, you can't help but wonder what a difference it would make to have had moving, colorized images of that war. Perhaps when viewed through the eyes of a cameras lens, rather than just the glorified portarits of young men in uniform, along with the biased rhetoric of both sides, that conflict could finally be put to rest. Because war, when seen up close and personal, is not pretty. 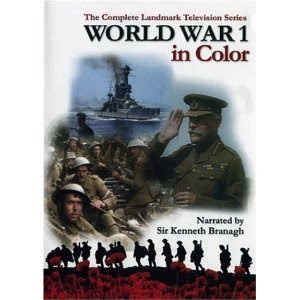 Whether you are looking for a good history of the First World war, or just curious to see the colorization of the news reels, this film will surprise you. From the streets of Whitehall, to Berlin, Paris, Moscow and even the major cities of the United States, as well as the battlefields themselves, this film has something for everyone in it. This is a top notch documentary.